Until you need to have a meeting, that is. If you’re in Los Angeles and your client is in London, you can’t just hop in the car and meet face-to-face. No, you have to do these things over FaceTime or phone and schedule them in advance at a time that’s suitable for both parties. 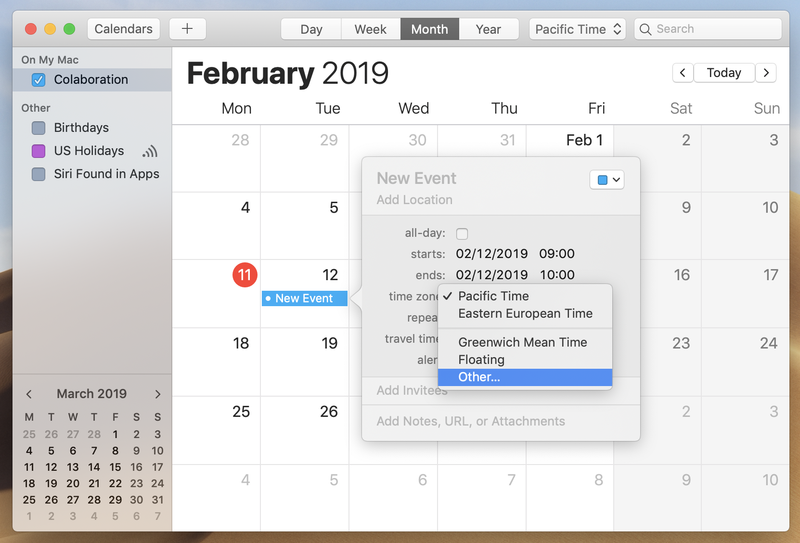 We’re going to show you two ways to schedule a global meeting; firstly with the help of your Mac’s Calendar, and then with the meeting planner app, World Clock Pro. By default, the Calendar app on your Mac is linked to your current time zone. However, it’s possible to change the time zone so that any new events that you schedule are saved in that time zone. For example, if you’re in L.A. operating on Pacific Time (PST) you can switch the Calendar time zone to London time (GMT) to schedule a meeting and revert back to PST time without losing the GMT time zone setting for the event. A pop-up menu will now appear next to the search field in the Calendar from which you can choose the time zone that you need. If the time zone you want doesn’t appear in the list, you can find it by selecting Other. With time zone support switched on you’ll be able to set the time zone for specific events. Do this by double-clicking on an event (or creating a new event), selecting the date, and choosing a time zone from the pop-up menu. To make sure that the event isn’t moved when you’re viewing the Calendar in a different time zone, choose Floating when editing an event. The Calendar app is useful for arranging meetings in one different time zone, but things can get a bit confusing and convoluted if you need to work across several time zones. Say, for example, your meeting with a client in London needed to include a member of the team based in New York and another in Paris. Using the Calendar app would mean creating several different events. If you’re a serial meeting scheduler, the more robust option of World Clock Pro is a much better solution. World Clock Pro is a powerhouse time zone converter and meeting organizer that seamlessly integrates with your calendar. Click on the map and drag the shadow across to select a suitable time. Notice how the time changes for each location as the shadow moves. Name the event and add the necessary tag (Work, Home, Family, or Events). Set an alert to remind you of the meeting, then click Add. The meeting will then be added to your calendar. Here’s how it’s done again, this time in video form. World Clock Pro is one of over 130 hand-picked apps on Setapp, chosen to help you get the most from your Mac. If you operate remotely with global clients or work closely with teams in different time-zones, it’s the best app around for ensuring meetings go off without a hitch. And it’s available for a free trial!